As one of the two yearly equinoxes, physical daylight is equally balanced with night at this time. For those of us in the Northern Hemisphere, daylight is on the decrease after the fall (or autumnal) equinox, moving towards the shortest ‘day’ three months later at the Winter Solstice. This year the northern hemisphere’s fall equinox occurs on September 23, 2015 EDT at 4:22 AM EDT. To find this in your time zone use this converter. The festival of the Fall Equinox in Druidry is known as Alban Elfed, which is Welsh for ‘The Light of Autumn”. Fall is a time of plenty and satisfaction. The seeds planted in the spring around the time of the Spring Equinox half a year earlier have survived as crops that have made it to harvest. It is time to enjoy the year’s accomplishments, and to ponder the shortening days to come. The Druid fall equinox festival is known as Alban Elfed, and also as Alban Elued or ‘Light of the Water’. 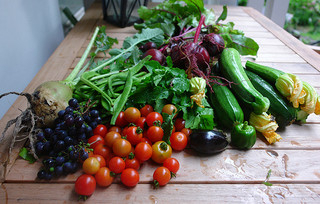 Autumn is a time to contemplate the diminishing strength of the sun, and of gratitude for the plentiful harvest. In Druidry there are three harvest festivals- Lughnasadh marking the initial ripening of grains and the ‘first fruits; Alban Elfed, a harvest of fruits and summer crops; and Samhain when all of the crops are in and excess livestock butchered in advance of winter. So at Alban Elfed the turn of the seasons towards Celtic winter and balance are contemplated, and thanks given for the plentiful harvest. The fall equinox is also known among many Pagans as Mabon. Mabon is the main harvest festival of the Wiccan calendar and marks the beginning of Autumn. It is the festival of thanksgiving where the Goddess manifests in Her Bountiful Mother aspects and the God emerges as the Corn King and Harvest Lord. Ireland– At the 5000 year old Loughcrew megalithic cairn in Ireland, the rising sun on the mornings around the equinoxes illuminate the passage and chamber. 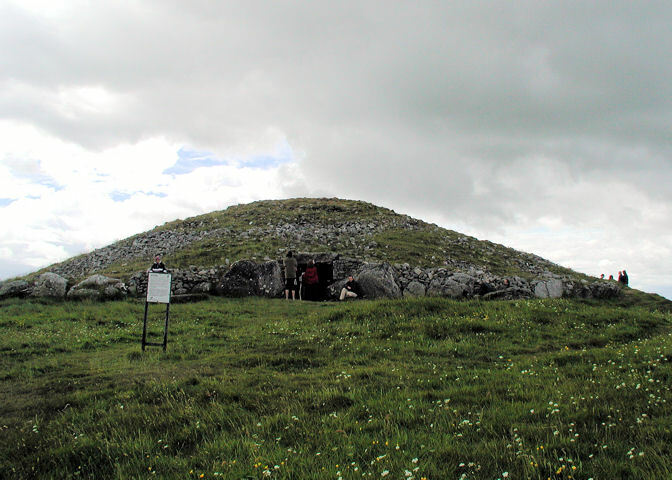 The east-west orientation of the passages at the Knowth monument at the Brú na Bóinne complex suggests astronomical alignment with the equinoxes. England– the Mayburgh Henge and Long Meg stone circle align with the equinox sun. Malta– During the equinox in the southern L-Imnajdra temple, the rays of the rising sun pass straight through the principal doorway to reach the innermost central niche. 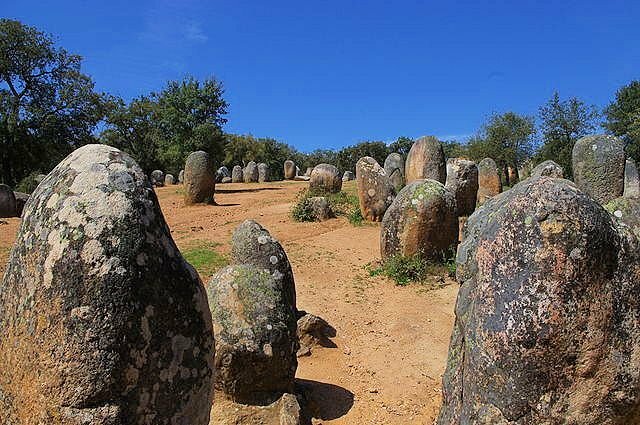 Portugal– The Cromlech of the Almendres megalithic complex is oriented to different directions associated with the Equinox. Europe– in some areas farmers believed that a spirit resided in the last sheaf of corn (grain) to be harvested. To chase out the spirit, they beat the grain to the ground. Elsewhere they wove some blades of the cereal into a “corn dolly” that they kept safe until seed-sowing the following year. Then they plowed the ears of grain back into the soil in hopes that this would bless the new crop. A harvest supper, also known as a harvest home, a dinner of thanksgiving and celebration, is also traditional (Harvest Festival). Asia– Chuseok is a major harvest festival and a three-day holiday in Korea held around the Autumn Equinox. As a celebration of the good harvest, Koreans visit their ancestral hometowns and share a feast of Korean traditional food, including with their ancestors (similar to feasts often held at the later pagan harvest festival of Samhain). The Autumn Moon Festival is held throughout China, and also in San Francisco, California, US. Slavic-the Dozhinki Slavic harvest festivals ((Polish: Dożynki, Russian: Obzhink, Belarusian: Prachystaya, and Czech: Dožínky) are held around the time of the fall equinox. The Dožínky Festival in New Prague, Minnessota is a Czech Harvest Festival patterned after the “Old Country” original, and is held on the third Saturday of September each year. In the version of the Ogam tree alphabet calendar popularized by Liz & Colin Murray (1988), the eleventh lunar ‘month’ of the year is in September. This month has the fall equinox, when daylight is again in equal balance with the dark. The Ogam tree associated with this month is ivy, or as the Ogam letter Gort. It represents the spiral of the self, tenacity, and indirect progress. In this same version of the Ogam tree alphabet calendar, the 12th and final lunar ‘month’ of the year is in October. 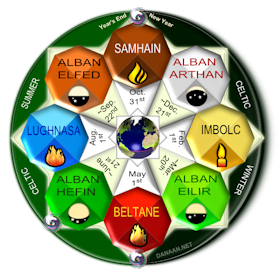 This month ends the Celtic year, and leads up to Samhain and 6 months of winter that follow. The Ogam tree associated with this month is broom (or reed, and/or fern) or as the Ogam letter Ngethal. It can represent cleansing, healing, and the restoration of harmony. The apple is one symbol for the fruit harvest in fall. The apple tree is known as Quert in the Ogam, and it is a symbol for health and vitality. Cut an apple width wise and it reveals a pentagram. The five points represent the elements of Earth, Air, Fire, Water with Spirit at the top, and also the directions of East, South, West, North and Within. Aubin, C. (September 21, 2001). Mabon- Overview. Retreived from Witchvox. Almendres Cromlech (2014) in Wikipedia. Chinatown, San Francisco (2014) in Wikipedia. Coifi, (January 18, 2012). Deeper into Alban Elfed. Retrieved from the Order of Bards Ovates & Druids website. Fox, S. (n.d.). Fall Equinox. Retrieved from the Circle Sanctuary website. Harvest Festival (2014) in Wikipedia. Long Meg and Her Daughters (2014) in Wikipedia. Loughcrew Equinox. (n.d.). Retreived from the Knowth website. Mayburgh Henge (2014) in Wikipedia. Megalithic Temples of Malta (2014) in Wikipedia. Order of Bards, Ovates & Druids. (2001). The Book of Ritual. East Sussex: Author. Wigington, P. (n.d.). Mabon History: The Second Harvest. Retrieved from Pagan Wiccan About website. Wodening, E. (1998). Anglo-Saxon Heathendom and Icelandic Asatru: a Comparison and Contrast. Retreived from Wikipedia. This Fall Equinox page was originally published on 8-9-2013, with many revisions since then.